10 Fun Facts About Microscopes! 1) Unlike telescopes, who people incorrectly credit to Galileo, nobody is really certain who invented the microscope. But it wasn’t very long after the telescope was invented that the first microscope was developed in Northern Europe, doubtless by lens grinders. 2) In the past, the biggest problem with using a microscope was illuminating the subject. Many microscopes used mirrors and they had to be angled just right between a light source and the staging plate. Until recently most kid’s microscopes used mirrors and could be frustrating to use. 3) There are actually two types of microscopes with very different purposes: Biological or Compound microscopes, which many are familiar with, are used for viewing slides. Inspection/Dissection microscopes are used to view specimens directly. Since Inspection Microscopes use two objectives and two eyepieces they give true stereo vision. Compound microscopes do not give stereo vision, even if they have two eyepieces, but most objects on slides are flat anyway. Compounds also give much higher magnification. 5) When you get to magnifications of 600x or more you very likely need to use something called ‘immersion oil’ to effectively view the subject. This is because the lenses at this magnification are very small and tight so just the air between the slide and the glass lens can mess up the path the light takes and distort the image. Immersion oil reduces that optical aberration. 6) Many microscopes use what are called “DIN” objectives. This is often seen as a sign of quality and that is usually true, but the DIN usually just means that a lens can be taken from one microscope and put onto another. 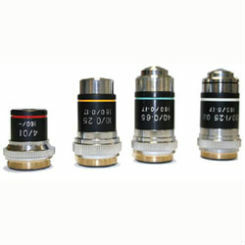 The DIN is simply noting that the threads for installing the objective lens are the same size & threading. DIN lenses themselves can be of many optical designs. 7) Once you get past a certain quality level, microscopes tend to become specialized for specific purposes. 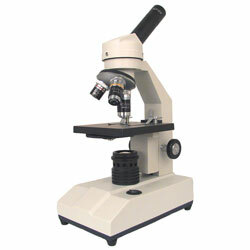 MOHS microscopes are used in Dermatology, for example. 8) If you see a microscope that has an angled body it is probably based off an old mirror- design and should probably be avoided. Someone is re-using old molds to make an obsolete design. Although these often have lights attached it still makes a poor design for everyday use. 9) When setting up your own microscope be sure to make certain you will be comfortable while using it. Many people have given themselves sore necks by having the microscope set too low. Also, if you have a microscope that is not binocular make sure that when you close one eye you are not making the other one (the one you are viewing with) squint. If you have trouble with this simply cover the other eye with your hand or learn to ignore what that eye is seeing when using the microscope. 10) If you are getting a microscope for yourself or as a gift, be sure to get some things besides a few prepared slides. Blank slides can be used to make your own slides, Concave slides can be used to view living creatures in water (get some from your local pond!). 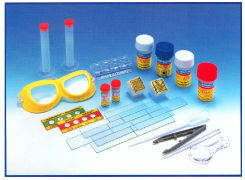 Slide preparation kits can be used to help prepare and stain slides. Microtomes can be used to cut sliver-thin samples from specimens. be sure to consider these things for the maximum enjoyment of the microscope! Want to buy microscope accessories? The Price of Rare Earth Neodymium Magnets – Up, Down, Up Down.